Wanderlust hits us hard at home whenever we scroll through @Pojiegraphy’s feed. 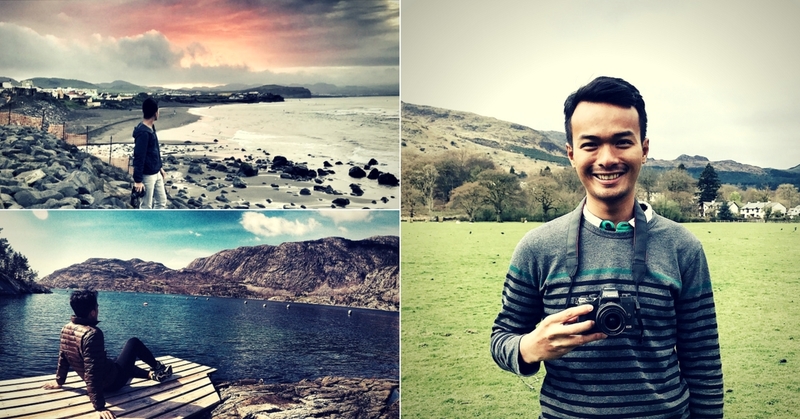 A journalism graduate whose interest for traveling-related content creation sparked after a leisure trip to Thailand, Mohd Shahril aka Pojie has not looked back since. After years of hardwork with a few note-worthy recognition in between, Pojie is living the life where most of us can only dream of. Read on to learn more about one of our favourite Sabahan! 1. Hi Mohd Shahril! Please tell us more about yourself to our readers. Hi! I am originally from Kota Kinabalu, Sabah and currently working as a freelance writer and photographer which goes by the name Pojiegraphy as my alias. I mostly travel the world, discovering new places, capturing moments and stories of people from different walks of life. 2. What inspired you to get into photography as well as blogging? I started to realize that I am passionate in the photography field when I was in high school holding a responsibility as an editor for the school magazine. Each day I developed different skills and knowledge based on my daily activities – being an official photographer for an event, assisting the team for a photoshoot and more. I enjoy reading book about photography and more attracted towards visualised journal or story. From this habit, I indirectly get an idea inspiration as well as motivation to delve deeper into this industry. I occasionally watch various documentaries on National Geographic and other travel shows before I realise how wonderful it is when we had an opportunity to showcase what is happening in the world to others. You know, photography brings people closer to the beauty of the world. Meanwhile, my journey as a blogger started when I created this humble space www.pojiegraphy.com as my digital journal where back then I love to share my daily thoughts (ramble, tips or some random stories) to my friends and so-called blog visitors. I love documenting what I’m doing every day and having this platform could keep these memories and allow me to reread it again and again in the future (and laugh out loud). On top of that, this is also one of the ways for me to enhance my writing skill and widens my knowledge. 3. We noticed that you’re inclined towards travel photography – why is that? I love travelling the world seeing the beauty of places I have visited from different perspectives such as culture, history and culinary but I find it quite unfair if I don’t show those beauties to others. I like capturing moments to showcase the colours of others’ life and to make people realise that the world is indeed a beautiful gift and made for us to explore. 4. Other than travel photography, what other kinds of photography do you prefer, and why? I’d probably pick journalism and nature photography. As mentioned earlier, I love capturing spontaneous and genuine moments. Through these types of photography, I am also able to appreciate things I see every day in my life. To fall in love with something, you need to learn how to appreciate it first. 5. How do you feel about collaborating with big brands and organisations, such as Malaysia Airlines, AirAsia, and Malaysia Tourism? It was almost unbelievable. To be honest, I have never imagined having this precious opportunity working with established brands like Malaysia Airlines, AirAsia, Tourism Malaysia and among others. As mentioned earlier, I utilised my blog and social media platforms mainly as my digital journal where I mostly share about my daily activities, which I never thought that people would be interested in reading it. After a few years, I developed my skills in writing and enhanced my creativity. It all started with a general content (tips and experience sharing) about my travelling adventure before some small organisations recognised my presence in the industry. From there, I started to bring this hobby into another level and now it has become a part of my source of income. Through this I learned one thing – “Always take a good care of your quality and people will automatically appreciate what you’re doing”. 6. Where do you get your travel inspirations from? In this highly evolving digital era, I have to admit that I garnered most of my travel inspirations from the social media and blog. Besides socialising, these platforms could help us to inspire other people in many ways. Travel, for instance, we share our travelling experience, we showcase how beautiful that one destination is and from there, people will get inspired and have a desire to explore that particular place. That’s what I do as well. I go out, capture as much moment as possible and inspire others. On top of that, I also get my travel inspirations by reading travel magazines as well as watching international and local travel documentaries to gain various useful insights. Some of my favourite travel shows are GOASEAN’s and Simon Reeve Around The World. What these two travel shows have in common? The values that showing how travelling can be a life-changing journey. 7. When it comes to selecting your own ideal travel destination, are you a nature lover or a city dweller? If have to pick one, I definitely go for nature. I live and in fact spent most of my time in the city area. That’s probably the main reason behind my choice. City environment is indeed charming in its way but as a nature enthusiast, I love to spend most of my time in nature. It is the perfect setting for me to find more writing inspirations, develop more ideas, get my works done efficiently and most importantly is to appreciate His creation. 8. What are the biggest challenges you’ve encountered in your journey as a blogger and photographer? The public perception towards blogger. Most people seen it merely as a hobby and hardly able to comprehend how it can be as someone’s life career. Thought it does not really sound like a challenge but this is something that I, as one of the bloggers, should prove and make them understand that we learn, achieve and earn something valuable through this too. Besides, time. I have been working as a freelance writer and photographer for few years. I enjoy doing these jobs with freedom from being attached to only one organisation but that freedom costs me something when I am not able to manage my time wisely. I feel like I own a full control of what I am doing and tend to always delay in everything. Procrastination has been my love-hate relationship, which I enjoy and at the same time, hate doing it. 9. Do you have any big plans coming up soon? I don’t have any big plan at the moment really. I just got back from my long travel adventure around Europe and now focusing on various content production and other projects while spending my precious time in my hometown and enjoy all the glorious food that we have. But surely I will plan for another big travel adventure soon. 10. If you weren’t a blogger and photographer, what else would you be doing? Computer engineer or doing something related to technology. I studied computer engineering back then when I was in high school. I have spent most of my school times playing with binary code, solving problems and exploring different kind of computer software. So, if I’m not a blogger or photographer like I am today, I’d probably be a computer geek, maybe. Follow Pojiegraphy and his travel adventures on his Instagram | Facebook | YouTube! Holographic Everything All Day Every Day!